Location - Kroki Nautika d.o.o. Our base is in the marina 'Dalmacija', Sukošan, 7 kilometres to the south of the ancient city of Zadar. Our base is on pier nr. 3. We invite you to visit this beautiful, historic port in the centre of the Croatian Adriatic coast. Travelling from the continental parts of Croatia towards the coast, you can visit the 'Plitvice' National Park and its world-renowned water-falls. Your holiday begins in the neighbourhood of 3 national parks: Paklenica, Kornati and Krka. 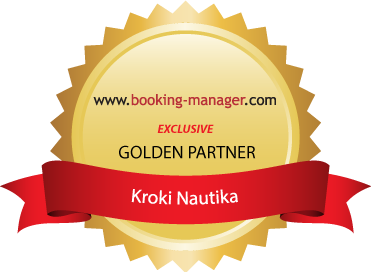 You can visit Kornati andd Krka on your Kroki yacht. The marina 'Dalmacija' is one of the largest Mediterranean yacht ports. It covers approx. 35 ha of land and about the same amount of sea surface. It offers a sufficient number of bathrooms and toilettes as well as a supermarket, bar, restaurant and a gas station. Close to the marina you will find a variety of restaurants, shops and bars, as well as recreational centres with tennis courts and other sports facilities. Our staff at the base will be glad to provide you with the information about the services offered in the marina and its surroundings. Parking in the marina costs EUR 5.50 per day. The marina is patrolled day and night by the security personnel to increase your safety and the safety of your property. Our base takes up an area of approx. 180 m2. We offer about 85 yachts between 26 and 54 feet in length produced by the most important sail-boat producers in the world: JEANNEAU, BENNETEAU, LAGOON, ELAN and BAVARIA. If you fly to Zadar or Split airports we will organize your transfer to our base. Make sure to notify us at least 1 month ahead of your arrival to ensure a well-organized transfer.